^ André Gerrits; Dirk Jan Wolffram. Political Democracy and Ethnic Diversity in Modern European History. Stanford University Press. 2005: 42. ISBN 9780804749763. ^ Ferenc Szakály. Hungary and Eastern Europe: Research Report Volume 182 of Studia historica Academiae Scientiarum Hungaricae. Akadémiai Kiadó. 1980: 178. ISBN 9789630525954. ^ Robert A. Kann. A History of the Habsburg Empire, 1526-1918. University of California Press. 1980: 611. ISBN 9780520042063. ^ Miklós Molnár. A Concise History of Hungary. Cambridge University Press. 2001: 88. ISBN 9780521667364. ^ Yonge, Charlotte. The Crown of St. Stephen. A Book of Golden Deeds Of all Times and all Lands. London, Glasgow and Bombay: Blackie and Son. 1867 [2008-08-21]. ^ Nemes, Paul. 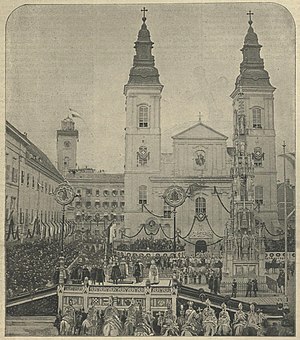 Central Europe Review — Hungary: The Holy Crown. 2000-01-10 [2008-09-26]. ^ András A. Gergely; Gábor Máthé. The Hungarian state: thousand years in Europe : [1000-2000]. Korona. 2000: 66. ISBN 9789639191792. ^ Walther Killy. Schmidt - Theyer, Volume 9 of Dictionary of German biography. Walter de Gruyter. 2005: 237. ISBN 9783110966299. ^ Július Bartl. Slovak History: Chronology & Lexicon, G - Reference, Information and Interdisciplinary Subjects Series. Bolchazy-Carducci Publishers. 2002: 222. ISBN 9780865164444. ^ Hungarian statesmen of destiny, 1860-1960, Volume 58 of Atlantic studies on society in change, Volume 262 of East European monographs. Social Sciences Monograph. 1989: 23. ISBN 9780880331593. 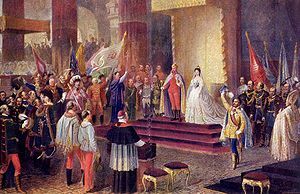 ^ Sowards, Steven W, Nationalism in Hungary, 1848–1867. Twenty Five Lectures on Modern Balkan History, 23 April 2004 [19 March 2009] . ^ Július Bartl. Slovak History: Chronology & Lexicon. Bolchazy-Carducci Publishers. 2002: 102. ISBN 9780865164444. ^ Andreas Komlosy. 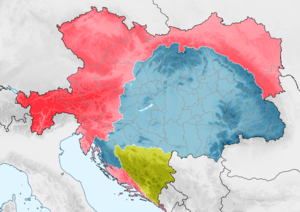 Imperial Cohesion, Nation-Building, and Regional Integration in the Habsburg Monarchy, 1804-1918. (编) Stefan Berger, Alexei Miller. Nationalizing Empires. Historical studies in Eastern Europe and Eurasia 3. Central European University Press. 2015: 398. ISBN 9789633860168. ^ Tihany, Leslie C. The Austro-Hungarian Compromise, 1867-1918: A Half Century of Diagnosis; Fifty Years of Post-Mortem. Central European History. 1969, 2 (2): 114–38. doi:10.1017/s0008938900000169. ^ Lackey, Scott. The Rebirth of the Habsburg Army: Friedrich Beck and the Rise of the General Staff. ABC-CLIO. 1995-10-30: 22 [28 May 2012]. ISBN 9780313031311. ^ Sabino Cassese; Armin von Bogdandy; Peter Huber. The Max Planck Handbooks in European Public Law: Volume I: The Administrative State. Oxford University Press. 2017: 294. ISBN 9780191039829. ^ István Bibó. The Art of Peacemaking: Political Essays by István Bibó. Yale University Press. 2015: 208. ISBN 9780300210262. ^ Eric Roman. Austria-Hungary & the Successor States: A Reference Guide from the Renaissance to the Present European nations Facts on File library of world history. Infobase Publishing. 2003: 401. ISBN 9780816074693. ^ Szávai, Ferenc Tibor. Könyvszemle (Book review): Kozári Monika: A dualista rendszer (1867–1918): Modern magyar politikai rendszerek. Magyar Tudomány. [20 July 2012] （匈牙利语）. ^ Flandreau, Marc. European Review of Economic History 10. Cambridge University Press. April 2006: 3–33. ASIN B00440PZZC. 1361-4916. ^ évi XV. Törvénycikk az államadósságok után a magyar korona országai által vállalandó évi járulékról. 互联网档案馆的存檔，存档日期2007-11-16. ^ Seton-Watson, R. W. Transylvania since 1867. The Slavonic Review. 1925, 4 (10): 101–23. Cornwall, Mark, Last Years Of Austria-Hungary: A Multi-National Experiment in Early Twentieth-Century Europe 2nd, University of Exeter Press, 2002 . Seton-Watson, R. W., The Austro-Hungarian Ausgleich of 1867, The Slavonic and East European Review, 1939, (19.53/54): 123–40, JSTOR 4203588 . Seton-Watson, R. W., Transylvania since 1867, The Slavonic Review, 1925, (4.10): 101–23, JSTOR 4201928 . Taylor, A. J. P., The Habsburg Monarchy, 1815 – 1918: A history of the Austrian Empire and Austria-Hungary., New York: Macmillan, 1952 . Tihany, Leslie C., The Austro-Hungarian Compromise, 1867–1918: A Half Century of Diagnosis; Fifty Years of Post-Mortem, Central European History, 1969, (2.2): 114–38, JSTOR 4545523, doi:10.1017/s0008938900000169 . Sowards, Steven W., Nationalism in Hungary, 1848–1867. Twenty Five Lectures on Modern Balkan History, Michigan State University, 23 April 2004 [19 March 2009] .